Most home and small businesses do not use a proxy server to access the internet, so if your computer keeps asking for one, here’s how to disable it. Make sure the box that says Use a proxy server for your LAN is not ticked. It’s ok to leave Automatically detect settings ticked at the top of the window, but you may want to check that Use automatic configuration script is not ticked. 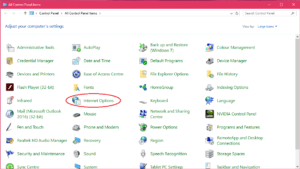 Press OK to close this window, and OK to close the Internet Options window. Restart your internet browser and check whether you can access the internet.